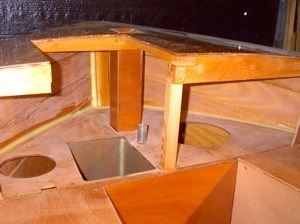 A better view of the sub deck area showing the motor well, rudder tube, mizzen mast box, and openings for waterproof access hatches. 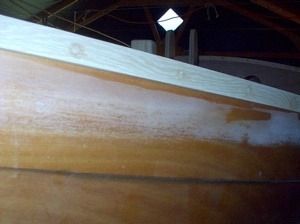 The rudder shaft will extend to the upper deck to keep the tiller clear of the outboard. The gray barrier coat/resin coating in the motor well is quite easy to see here. A work in progress. The locker lid receives its first bit of mahogany framing and is shown off in place. 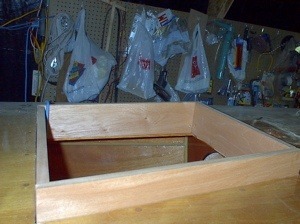 The designer specifies a groove in the frame around the lid perimeter for proper drainage. Our previous boat had the same arrangement and it worked quite well. The seats angle inboard slightly so water will run off readily. 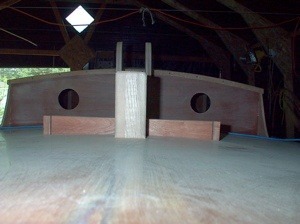 The forward hatch coaming is trial fitted into place. 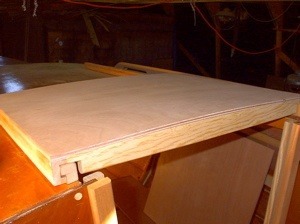 No fancy joinery here, the use of epoxy eliminates the need to get overly complicated. 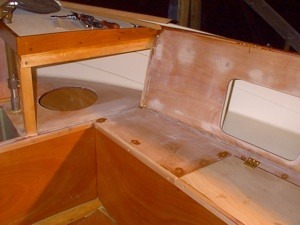 I've been busy with the companionway hatch, too.� This shot shows the mahogany hatch rails as well as the trim to hold the drop boards. 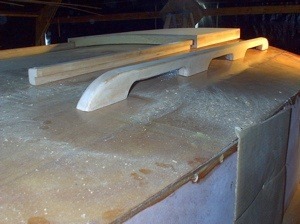 The cabin top grab rails are roughed to shape now. Here I have just set them in place to check for fit. 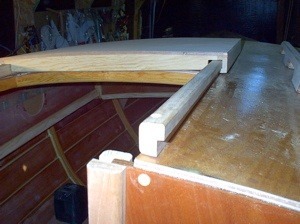 With a little creative spacing of the uprights, I managed to land on all 3 cabin beams for secure mounting points. I'll need to add a backing block for the aft upright. The cardboard over the port openings allow me to use heat in the cabin so that epoxy will cure even though it's still quite cool outside. The white oak rub rails are now in place. 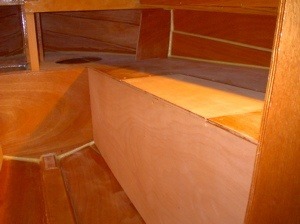 I used plenty of screws and scarphed the pieces right on the boat. The screw heads have been plugged and sanded in this area. I use the Lee Valley drilling kit for countersinking and their "snug plug" cutters for the plugs. The system works great. Sort of a "stem's eye view" showing the samson post, hatch coaming, tabernacle and cabin front about the way it will look when finished. Still lots to do before paint and varnish. Everything that could be removed was and the deck was given a thorough sanding. Now all the stuff we took off can be permanently installed starting with the toe rails. Next the hatch coamings, Samson post, etc., etc..
We’re now back in the cockpit for the final filling and sanding before getting out the varnish and paint again. 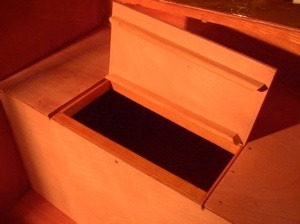 The mahogany trim and locker lids have now been fitted. 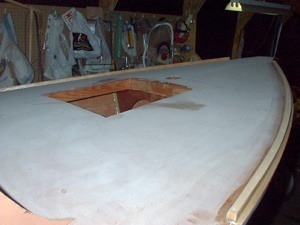 Horizontal surfaces will be painted with anti-skid paint to match the decks while vertical surfaces will be varnished to match the other varnish areas of the boat.